BuzzFeed.com lists UNCG's Weatherspoon Art Museum as one of world's 'hidden gems'. 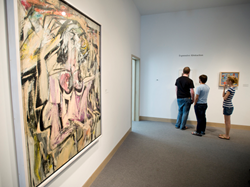 Willem de Kooning's "Woman" is back home at UNCG's Weatherspoon Art Museum after being loaned to the Museum of Modern Art. Milan, Greensboro, we’re in the same boat. I’m thrilled that we’re getting national and even international attention. The Weatherspoon is third on the list compiled by the social media company, between Milan’s San Satiro church and Dublin’s Blessington Street Basin. BuzzFeed boasts a global audience of more than 130 million. The Weatherspoon was founded on campus in 1941. UNCG was Woman’s College at the time. Doll says she constantly receives personal testimonies from artists and other visitors who enjoy the Weatherspoon. The free museum -- the tagline is Free Admission. Free Parking. Free Thinking.-- is home to lithographs by Henri Matisse, paintings by modern greats Willem de Kooning and Andy Warhol, and a series of Warhol’s Polaroids. In April, Better Homes & Gardens included the Weatherspoon on a list of museums and galleries worth planning a weekend around. That listing notes the museum’s “impressive collection of modern American art, considered one of the best of its kinds in the Southeast” as well as its “intriguing selection” of visiting exhibitions and a 7,000-square-foot sculpture garden. The University of North Carolina at Greensboro is a challenging, supportive and engaged community where learning is carried forward to do something bigger altogether. Founded in 1891, UNCG is the largest and most diverse university in the Triad, serving more than 18,000 students. Standing apart from other universities, the UNCG community is joined together by a shared value: We define excellence not only by the people we attract, but by the meaningful contributions they make.